The Russian Forbes magazine has published its annual ranking of the 100 Reliable Russian Banks 2019 based on 2018 data. UniCredit Bank ranked as the number one. «This year UniCredit Bank celebrates its 30th anniversary in Russia. All these years we have always been proud of the high reliability and effectiveness of the Bank, which are valued by our customers and partners. It is important for us that respectable media have confirmed the Bank’s excellent reputation for many years. We are glad that this year UniCredit Bank took the well-earned first place in the Forbes magazine ranking,» says Mikhail Alekseev, Chairman of the Management Board of UniCredit Bank. This year there are 30 banks in the group of the most reliable financial institutions recognised by Forbes in Russia versus 13 a year ago. UniCredit Bank has been among the most reliable banks in Russia for eleven consecutive years, ranking second for two years in a row in 2018 and 2017. 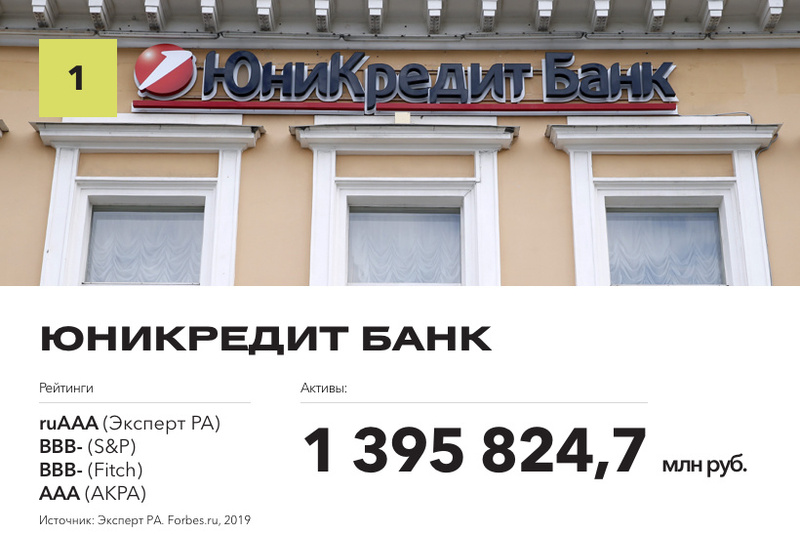 The Bank achieved the number one ranking this year thanks to its high credit ratings from leading international and Russian rating agencies as well as other solid key indicators, including volume of total assets.